Like many pediatricians, I recommend that you introduce solid food to your baby no earlier than 6 months old. 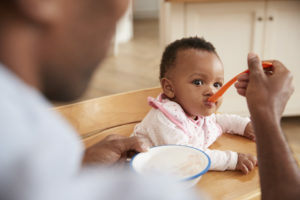 A study published in the April issue of the journal Pediatrics shows many moms are jumping the gun and feeding their babies solid food earlier without knowing the risks. Of the 1,300 moms that were questioned, 40 percent introduced solid food before 6 months. Half of these kids were fed solid food before 4 months, and in 10 percent it was actually started in the first 4 weeks of life. Why should moms wait until 6 months? Solid foods aren’t as nutritious as breast milk or formula. Solid food can be lower in good nutrition and higher in calories, which can cause obesity. Solid foods are harder to swallow. A baby may not be developed enough to swallow solid food properly before the age of 6 months. Solid food may increase the risk of health problems. Solid food given too early may cause allergies and eczema, and researchers say there may be a link to chronic diseases like diabetes and celiac disease. Yet the moms who fed their babies solid food early thought they had good reasons too. Many thought their babies were old enough, were hungry when they were fussy for other reasons, or they just wanted to supplement the breast milk or formula. If your baby is under 6 months old and is taking in enormous quantities of breast milk or formula, really seems unsatisfied with feeding or is fussy all the time, it may have nothing to do with feeding. It could be a variety of other behavioral or even medical issues. If this is the case, please don’t turn to solid food. Call your pediatrician. We can help you figure it out. Is Overeating Learned in Infancy?